Wildwood was like a modern day reading of The Lost Diaries of Susanna Moodie , another book I enjoyed tremendously. I ripped through Wildwood in a few short days. Molly lives in Arizona, is flat broke, and has a 4-year old daughter, Bridget with special needs – she has not ever spoken a word to anyone other than her mother and suffers from severe anxiety. Therapy for Bridget is wildly expensive and is unfortunately one of the first things to go when Molly loses her job. Just as she’s about to hit rock-bottom, Molly is contacted by a lawyer in Alberta concerning her great-aunt’s will. Molly is shocked to hear this, as she thought her great-aunt had passed away years ago. However, she has left Molly an old farmhouse, way, way off the grid in northern Alberta. The stipulation in the will is that as long as Molly lives in this farmhouse for one full year, she will then be free to do whatever she wishes with it. For Molly, this would mean selling it and having the opportunity to provide for the much needed treatment for Bridget. She blindly yet necessarily agrees to live like a pioneer for one year in a farmhouse far off the grid with no electricity and no running water. Desperate and broke, Molly sees no other option for her and Bridget. The twist is that the lawyer is shady, does not provide Molly with the complete details and insists the farmhouse and the land its on is worthless, even though it sits in prime oil and gas country. He swindles her into believing the money she receives in rent from the family that works the farmland is only $400 a month. This was the agreed upon amount way back in the day when her great-aunt owned the property, and he claims the agreement was never updated. As the story moves along you really do hope Molly grabs a clue to how shady this lawyer is, the lies he spews and tunes in to the questioning looks from those she meets around her when she says she cannot afford many luxuries. Truly, she is living like a pioneer! At times, almost dangerously so. You really hope Molly will grab a clue soon and realize he’s trying to make it so she cannot survive to drive her out. But even though faced with these incredible obstacles, Molly and Bridget are flourishing. They’re adapting quite nicely, and each night Molly settles in by lamplight to read her great aunt’s diary of what it was like living like a pioneer, and first married in the ’20s. At the end of reading each diary entry, Molly marks the number of days she has left, counting down from 365. While reading, I couldn’t help but compare Molly to being a modern day Susanna Moodie. It put a real smile on my face when I reached the part of the story where she references Susanna Moodie too! 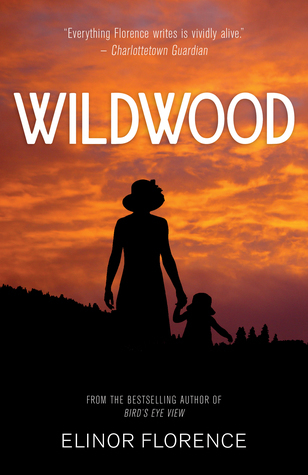 Wildwood has a very satisfying ending and I thoroughly enjoyed reading this one! I really enjoyed reading the funny little bits of an American moving to Canada and getting used to things like the metric system, shopping at a Canadian Tire, loonies and toonies and the rainbow coloured money. Taking this journey with Molly was exciting and delightful, reading the diary entries of her great-aunt and receiving inspiration from her and Molly’s memories of her parents made this a delight. Does Molly take the money at the end of the year and run? Look for it to come out in February 2018 and find out!